Roger Goodell, an economics degree holder from an indiscriminate eastern college who rose through the ranks at the NFL office in New York to become current NFL Commissioner, has damaged “The Shield” (the official NFL logo) in his short nine-year tenure enough to warrant the owners to demand his immediate resignation. It has been coming for quite some time. Goodell, whose dad was appointed to replace Senator Robert Kennedy, upon his 1968 assassination, first landed an NFL job in 1983 as an intern for the New York Jets. These would be the same New York Jets that fight for a playoff berth yearly against the current World Champion New England Patriots. Perhaps that is a subconscious motive Goodell may have for trying to undermine the reputation of a player that has become every little boy’s dream; to come from nowhere and become the greatest. Oh yeah, become a millionaire and marry a super model as well. 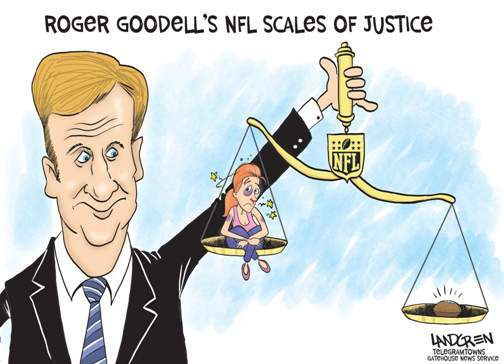 Goodell became NFL Commissioner in August, 2006, after acting as NFL Executive VP and COO since 2001. Recently, Business Week stated that he is the “Most powerful man in sports.” His duties as Executive VP included oversight of the NFL officials, a fact that may become important below. Unfortunately for Goodell, his players seem to be keeping national crime beat reporters busy with their off-field exploits at an alarming rate with no end in sight. Ray McDonald, formerly of the 49ers, and his spousal abuse allegations are a regional example. Yes, allegations, that’s plural. Let’s not forget All-Pro running back Adrian Peterson was arrested for “reckless or negligent injury to a child,” his four-year old son in Texas. TMZ published photos of slashes on the child’s legs, buttocks and back from a tree branch. Peterson was suspended in November for the remainder of the 2014 season only after the TMZ report was made public. There’s Adam “Pacman” Jones and his drug, weapons, assault history culminating in paralyzing a Las Vegas patron in a shootout he was involved in. Two-time Super Bowl quarterback Ben Roethlisberger in 2009, had his penalty of a six game suspension reduced to four games for allegedly sexually assaulting two different women. He was never charged with a crime although he reached out-of-court settlements with the accusers. In 2013, Patriot’s tight end Aaron Hernandez was arrested for murder of his friend by gunshot. He was convicted in 2015. In 2012, “Bountygate” was uncovered. Seemingly, the New Orleans Saints coaches had allowed money to exchange hands if a defensive player were to knock an opposing player out of the game. The head coach and defensive coordinator were suspended without pay for an entire season. Players were also suspended and a fee and draft picks were also lost. This was followed by the NFL official’s lockout at the beginning of the 2012 season. The commissioner’s words of making the sport safer and protecting the players were thrown back into his face as high school and lower echelon college officials ruled over NFL games the first two weeks of the season. The NFLPA pressured Goodell into reaching accord with the officials as they pointed out game’s integrity and the safety of its players were challenged by the use of replacement refs. The two game suspension quickly turned into an “indefinite” suspension once TV tabloid TMZ obtained and posted the video for all to see. However, the NFL’s suspension was overturned on appeal. One of many setbacks the NFL has suffered during Goodell’s tenure.